Prime Minister John Key talking to reporters in Auckland on May 27. Photo by Bernard Hickey for Hive News. 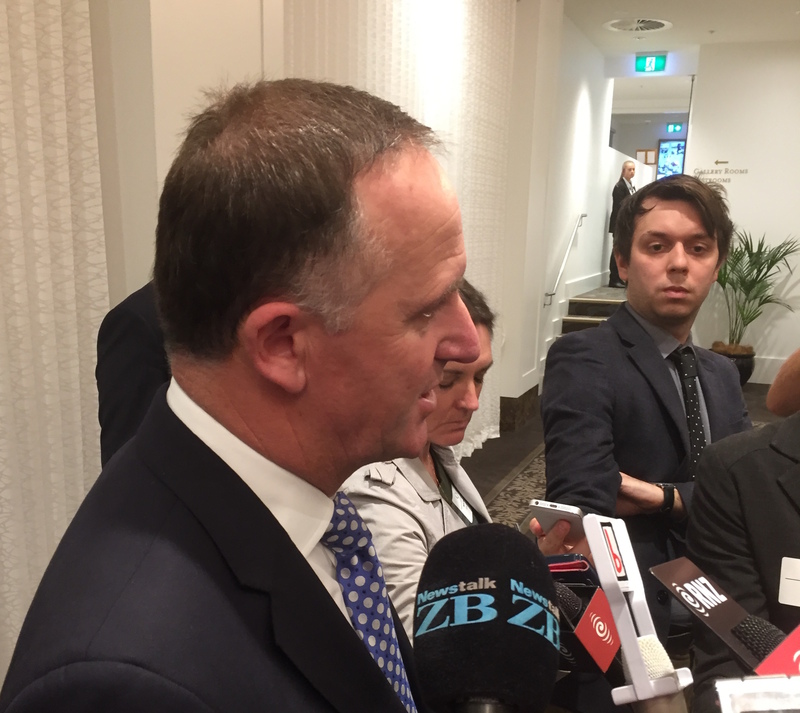 Prime Minister John Key has upped the ante in the Government's battle with the Auckland Council to free up more land for housing, saying a new National Policy Statement in the next fortnight would direct Councils to release land as a matter of law. Responding to Council concerns that it could not afford the NZ$17 billion infrastructure bill to provide the roads, public transport, water and sewage pipes to underpin that housing, Key said the Auckland Council may need to look at selling assets. Key used his flagship post-Budget luncheon address to a Trans Tasman Business Council audience in Auckland to increase the political heat on the Council ahead of its decision on the Unitary Plan due on August 19, and to deflect some of the political heat building up on the Government around Auckland's housing supply shortages. Key described the Metropolitan Urban Limit put around Auckland in 1992 as an "utterly failed experiment" that increased land prices from NZ$100,000 per section to NZ$450,000 per section now. Key said the solution to Auckland's housing supply shortages and high land prices was to release enough land to meet demand, and he pointed to how land releases in Christchurch had stopped land prices rising and was starting to reduce rents. "Because we had CERA (Canterbury Earthquake Recovery Authority with special powers) and because we had Commissioners in there with ECAN, and we could go out there and release a lot of land, we did exactly that and a lot of homes got built in Christchurch," he said. "So what's going to happen in the next week or two, is the Government is going to issue a National Policy Statement on urban development. What that does is it says to the Councils right across the country, but different conditions where the pressures are greater, so different conditions in Auckland, is that the NPS have to be met and they have a link to economic issues," he said. "So in other words, what is the land price vis-a-vis the demand that's in the economy. And if the land price is going up too quickly, they have to amend their plans to release enough land. And if they don't do that they'll breach the law," he said, referring to the way the Courts had given the deciding weight to an NPS in the King Salmon case in an RMA dispute. "It quite clearly shows you the courts think the NPS take precedents over other things. It will mean if land prices keep going up and there is not enough supply, what will ultimately happen is the developer will go along and say I want to zone this residential and if the Council say 'no' and the developer takes the Council to court, the developer will win. That's where it's going. And the same thing is going to happen in commercial land as residential land," he said. "There won't be a debate about whether they release more land. They'll be releasing more land." Key pointed to the price of a house and land package for a three bedroom house in Christchurch being NZ$400,000. Key said the challenge for the Government was to make sure it funds the infrastructure that supported the release of the land. "The Government is continuing to look at what the roading and transport demands are in Auckland to see whether it's meeting all those requirements, in the same way we looked at the CBD rail tunnel, where we said 'yep' that has to be funded by the Government," he said. Later, Key told reporters there would be a number of factors within the NPS that would need to be met, but he declined to say whether it would include a house or land price to income multiple, or some sort of land price escalation clause. However, he repeated that rising land prices would lead to more land release. "Certainly the desire and the economics around someone land banking will be substantially reduced," he said. He said the Government was happy to step up and support the funding it's share of the infrastructure needed to support house building on this land, "whether it be schooling or roading." "The Government may well have to invest more money in Auckland over time to support that infrastructure," he said. Challenged again on how Auckland Council will be able to pay its share given it is up against it's debt limits, Key said: "In the end Auckland Council has its responsibility, its balance sheet, and its challenges it needs to meet, but it can't just put its hand up and say it's all too difficult any more than the Government can." Key said debt was not the only way for the Council to fund its share of the infrastructure. Asked if they should sell assets, he said: "They might do."